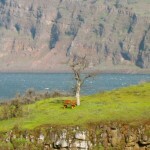 There are four easy walks around Mosier. Just across the bridge is a path that leads up the hill. On top of the hill is the Historic Cemetery. Look around at the historic grave stones and then turn and look out at the river. Quite a view. Continue along the trail along Dry Creek until you reach the view of Pocket Falls. Take a nice long look and when you’re ready turn around and begin your meander back. Take small path down to grassy road way along the railroad. Turn Left (West) and walk for 1 mile to the Waterfront parking lot. At the far SE corner of the lot is a trail that heads East through the woods, under the overpass and around Harmony Lake. 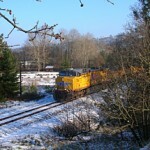 The path continues to wind under the next overpass and travel along the Columbia River. Start on the steps of the Mosier School -or better yet the swings. Then make your way across the school yard and across the old gas station to the 10 Speed coffee shop. Buy a coffee to go and spend a few minutes in the field behind them throwing sticks for local dogs. Head up to 3rd street and turn left, strolling past the Fire Station on the left and the First Christian Church on your right. Wonder to yourself what it looks like inside. Sit down on the bench in front of the Church and behold the wonder of the country’s smallest library. From here you can also see Town Hall -that little red building to the left? Yep, that’s it. When you feel like it, keep going another block in a half until you spot the Mosier House B&B on your right. 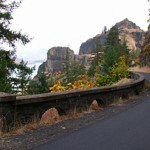 This was the home of the founder of Mosier. Imagine what it would be like to found your own town. Turn around and head back the way you came, but this time turn left at the first street you come to (it’s Oregon Street but it’s unmarked) and walk a block up to the Mosier Grange. Cities don’t have granges. Continue on past the Grange and turn right at the next block. This is Main Street. Down Main you’ll see the Post Office (which used to be an old bank) and the American Legion Hall on the left and a few steps further, the Thirsty Woman. Stop and have a beer -you need a rest. Hungry? You may also want to have a bite at Good River next door. Take your time. Once you’ve slowed your heart rate, continue down the street until it reaches Hwy 30 and turn left. 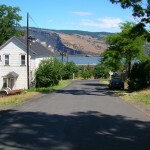 Walk one block and grab a cool drink at the Mosier Market and take it across the road to the picnic area at the foot of the Mosier Totem Pole. If the Fruit Stand is open, it wouldn’t kill you to add a few blueberries to your snack. Now this last step is tricky, try not to get lost. Directly in front of you is the Route 30 Ice Cream shop. Look both ways before you cross and buy a cone. 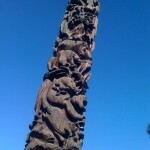 Take it back to the Totem Pole and sit quietly taking it all in. The ice cream, the weather, the sound of the odd train, and the lack of bustle.